Whilst I wouldn’t want to add anything to Mother nature’s perfection, everything does sparkle with glitter so why not acorns! I think they look quite cute all sparkly! I thought it was a great idea so hid our glitter acorns and marked them on the map. The map really helped as the acorns are pretty small even if they sparkled making them easier to find. For a bit of decoration I painted some acorns, initially I used ready mix paint, but it flaked off so did them again with acrylic paints which worked much better. The boys also enjoyed painting the acorns, although they mostly ended up brown – fun, but not that pretty! The idea for painting acorn caps came from Paint Cut Paste they used markers to colour the inside of the acorn caps, instead I used paint, but then also like the original post used glue to make a lovely shine. They look lovely! I did these without the boys, but it could easily be done with older kids. My plan was to then using them in a game of matching pairs – by turning them face down and matching the colours – if you get to give it a go let me know! 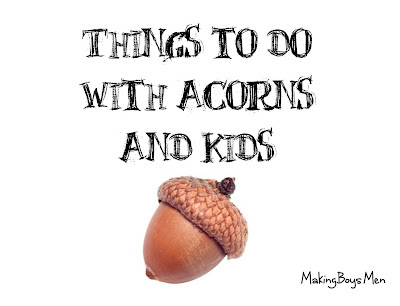 We also popped the acorns as well as chestnuts (conkers) and pine cones for a sensory bin, ours was very simple, but check out some of the great ones from 1 + 1 + 1 = 1 andHappy Hooligans. These great ideas were posted by Making Boys Men, but girls will love it too! Au Pair Live-in Childcare is Flexible and Affordable. I am a Local Area Representative for Go Au Pair. If you are interested in a cultural care experience for your family click here: http://www.goaupair.com/Northern-New-Jersey.aspx or feel free to contact me at AuPairRep [at] gmail DOT com. Fall is a great time to explore the night! Head out for an evening of exploration on a cool autumn evening. Enjoy a few books and activites that highlight the night! Halloween isn’t the only reason to get out at night in the fall. Any evening can be turned into a fun time with a Night Hike. Make sure to dress warmly, and bring along a flashlight to light up anything you might see. Keep your eyes open as you walk. Remind that kids that there are many animals that are nocturnal (they hunt and stay awake during the nighttime). Keep an ear out for owls, and an eye out for other animals such as opossums, badgers, mice, fox and bats! Spend a few evenings watching the moon. Kids will notice that the moon changes over the course of a week or two. Head outside each night and take a peek at the moon. Have your child draw it’s shape each night — here’s a moon chart you can use to keep track of how its shape changes. This early-science reader introduces the different phases of the moon and why the moon seems to change its shape each night. A beautifully illustrated story about what happens at night under the harvest moon. Follow a little girl and her cat as they enjoy a nighttime adventure. A cute tale about a little girl who wants her Papa to get her the moon. But it’s too big for Papa to take home. A creative story about the waxing and waning of the moon. 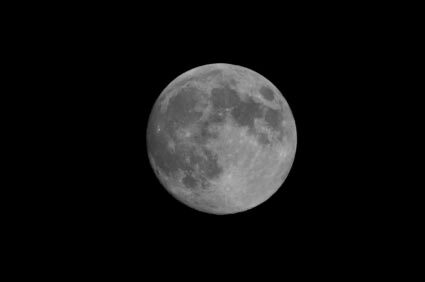 Learn all about the history of the moon, describes its phases and explains how we’ve explored it over the years. I’ll admit, bats are not one of my favorite animals. But they are very interesting to learn about and observe. Bats can be found in many areas but are not often easy to see. Kids may ask how bats fly at night without flying into houses and trees. Explain that bats use echolocation to get around. Ecolocation uses sound waves that the bats send out; sound waves bounce off items like houses and trees so bats get an idea of how close they are to an object. Here’s a fun song by Jump Start about ecolocation – very catchy! Since bats are difficult to view, you might want to visit a zoo that has a bat exhibit. Learn all about these wonderful evening creatures in this great nonfiction book for kids. Learn about the amazing abilities of bats! A very fun series of books, this one shows what bats do when visiting the beach at night! A fun look at how nocturnal animals would enjoy the beach. Enjoy a fun nighttime party with these cute little guys — and don’t forget your ‘moon-tan lotion’. Follow bat as she flys through the night sky looking for her evening meal. See how she uses sound to find her way around and then back home to feed her baby. Go along for a ride when the Bus turns into a bat and explores a spooky mansion. 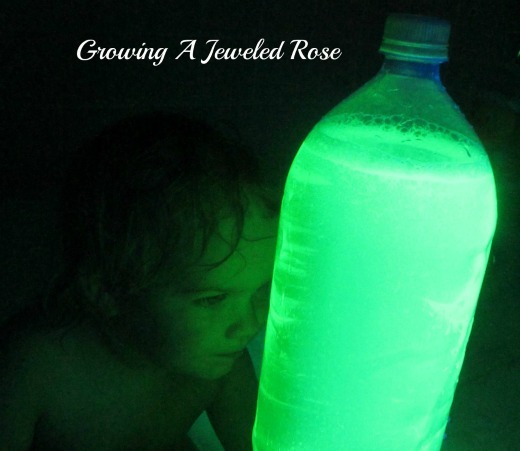 Kids will enjoy this early science look with a Halloween theme! Here are some fun games to play with the kids on Halloween from About.com Family Fitness. Put on “Monster Mash” and other seasonal tunes. Have kids show off their silliest monster dance moves—but they must freeze in place when the tunes turn off! 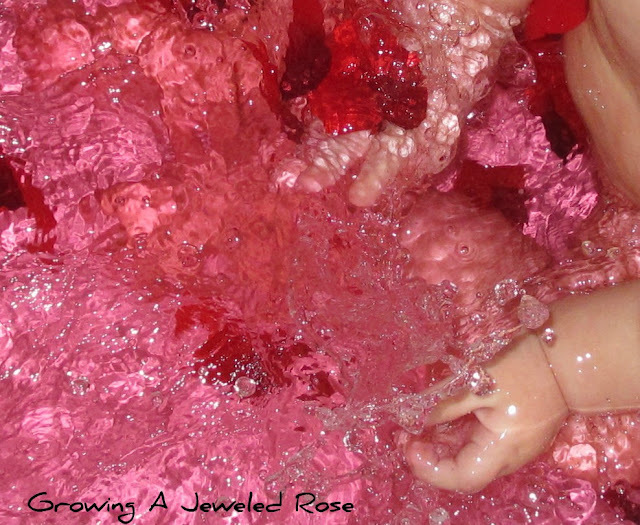 Instead of bobbing for apples in a bucket of water (which can really wreak havoc on costumes or face paint! ), have kids try to “snap” a bite from an apple hanging on a string. You’ll need apples with stems—tie the string to the stem, then loop it around a tree branch (outside) or a broomstick or suspension curtain rod (inside). Adapt the classic backyard game of Capture the Flag with a ghostly theme! Use white handkerchiefs for the flags. This adds an extra challenge because it will be hard to tell the teams’ flags apart from one another. For smaller kids, you might want to use Halloween-themed fabric scraps or large felt pumpkins instead. Get creative with this one—there are lots of silly ways for kids to get from the starting line to the finish! Try having them stagger like zombies, fly on broomsticks like witches, or hop like toads. They can also carry a Halloween-themed snack. Or stage a costume relay for guaranteed silly results. Choose smallish pumpkins with short stems (depending on the ages of your party guests). Set up 1- or 2-liter plastic bottles and tape off a starting line for an instant bowling alley. Fill the bottles with a bit of sand or rice if they topple over too easily. You can also have kids decorate the bottles with stickers, markers, and other art materials. Have kids roam the yard or the house on the hunt for skeleton parts (cut from paper, or plastic ones purchased from a toy store or craft shop). For an extra challenge, see if the party guests can reassemble their bony treasures into a complete skeleton set. For this version of Pirates’ Treasure, use Halloween-themed objects (say, mini plastic pumpkins, or glow sticks) for the treasure. Larger plastic pumpkins, decorated paper bags, or even large stockpots (think witch’s cauldron) can serve as the treasure chests. Cut pumpkin shapes from construction paper and arrange them on the floor; kids must move from pumpkin to pumpkin while music plays, just like in musical chairs. To keep kids from being excluded, allow them to share pumpkins as you remove a pumpkin for each round. By the end of the game, all the kids have to squeeze onto one spot. For variety, you could also use spider webs, tombstones, or witchy cauldrons for targets. This goofy race requires kids to work together (and stick together) as a team. Divide the group into two equal teams. Teams must line up and form a “worm.” The person at the front of the line reaches his left hand between his legs; the player behind him grabs it with her right hand; and so on all the way to the end of the line. When you say “Go” (or “Boo!”), each tteam must run to a goal line and back. Whichever team gets back first is the winner—but only if their worm is still intact! Challenge kids to decorate a pumpkin without being nabbed by the ghostcatcher! Decide how many teams you will make based on the number of children (2 teams for a small number of children, 4 teams for a classroom.) Have enough stickers for the team members to have one each of the same sticker. Choose a child to be in the center of the circle of children. Divide the rest of the children into teams of ghosts, for example Red Ghosts, Blue Ghosts. Place the pumpkin in the middle of the circle and blindfold the Ghostcatcher. Ghosts crawl around the circle on their knees and try to sneak to the middle to put their stickers on the pumpkin. If the Ghostcatcher hears a sound, he points in that direction and says, ‘Ghost!’ If the Ghostcatcher catches a Ghost before he places his sticker, that child must start over again. Time the game for 5-8 minutes. The team that has placed the most stickers wins prizes. Nothing is more fun for a child then announcing a scavenger hunt. It doesn’t have to be complicated, just have them search for objects that they can find around the house. If you want to give them a reward for finding all the items on the list, think about taking them to that new park after or a special snack. 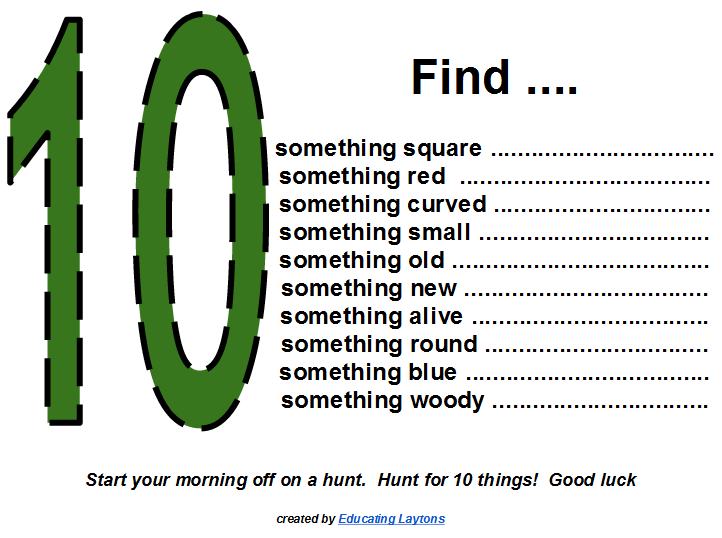 This list is an example of items to include on your scavenger hunt provided by Educating Laytons. Three year old children can make big messes and aren’t always willing to participate in cleaning up. Make cleaning up a game by setting a timer for 5 minutes, putting on some lively music, and telling your child that you’re going to do a “5 minute boogie”. This means that you focus on one room and clean or pick up as much as you can for 5 and only 5 minutes. If the room still isn’t clean after the timer goes off, that’s okay. You’ll be amazed at how much cleaning you and your child can accomplish in 5 minutes, and the timer and music make this a game rather than a chore. Supplies Needed: Fluffy yarn and your hands. Start with a ball of yarn. Make a slipknot and secure on thumb. With palm facing front, begin looping yarn from the back of the hand behind index finger around to palm side and back then move on to middle finger, ring and pinkie fingers. Loop yarn from the back of the hand behind index finger around to palm side and back, moving on to middle finger, ring and pinkie fingers. 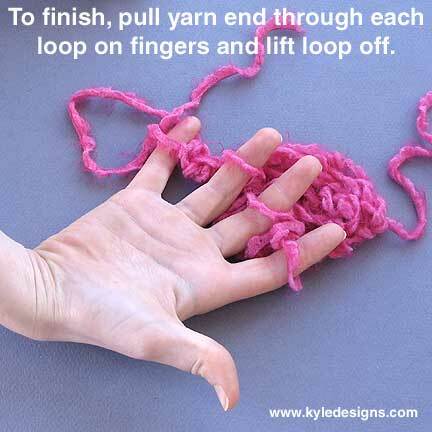 Once you reach the pinkie, wrap yarn around it twice and continue back across the fingers again until you have two loops on each of the four fingers. 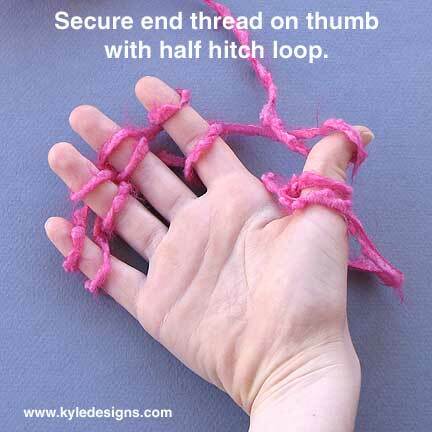 Secure end of yarn on thumb with a simple half hitch loop. Wrap yarn around pinkie twice, continue back across the fingers again until you have two loops on each of the four fingers. Secure end of yarn on thumb with a simple half hitch loop. 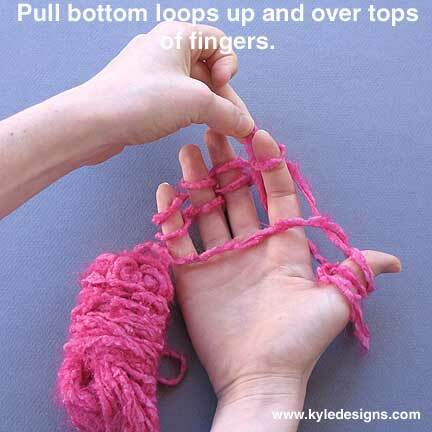 To begin finger knitting, lift bottom loop on pinkie finger up and over top loop and pull to back side of finger. Continue with the other three fingers until there is a single loop on each. Note: On index finger, be sure to work with the set of loops closest to the thumb. 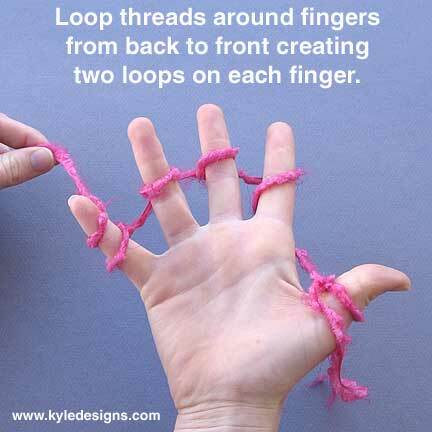 Add another row of yarn, looping around each finger from the back to the front until each finger again has two loops. 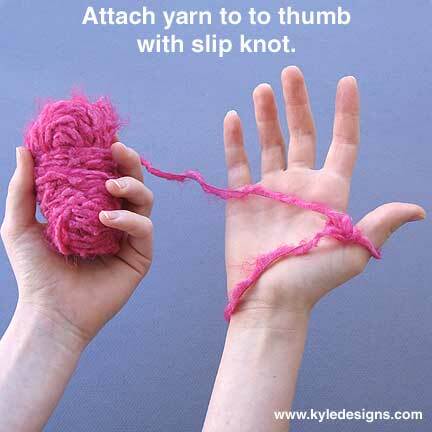 At this point, the last loop is on the pinkie with the ball of yarn coming away from it. Knit as before, starting with the index finger and pulling bottom loops over top loops. 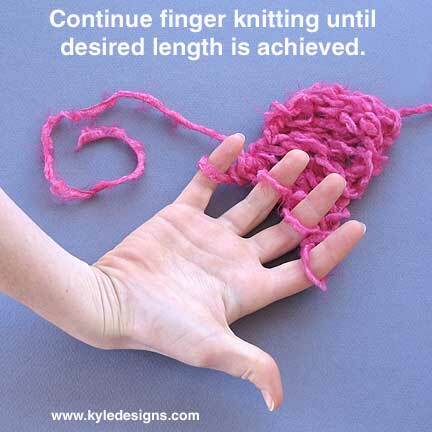 Continue adding a row of yarn and knitting back and forth across the fingers until the desired length is achieved. Once you’ve knitted a few rows, it is safe to drop the starter loop of yarn being held on the thumb as knitting won’t unravel from that end. Need to stop temporarily? 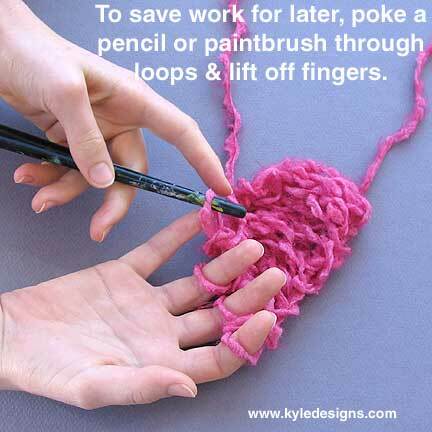 If you need to take a break, you can easily remove the knitting from the fingers by pushing a pencil, paintbrush or chopstick through the loops and then lifting them off. Just set knitting aside. 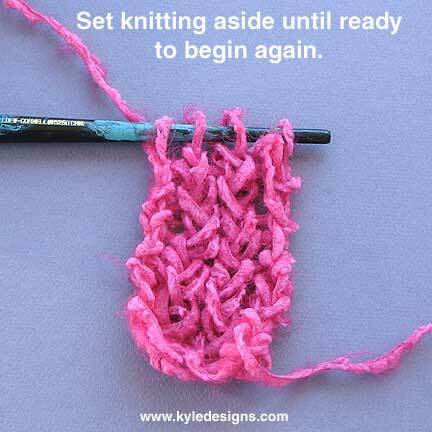 When ready to begin knitting again, simply slip your fingers back through each of the loops and remove pencil. Set fingerknitting aside until ready to start again. 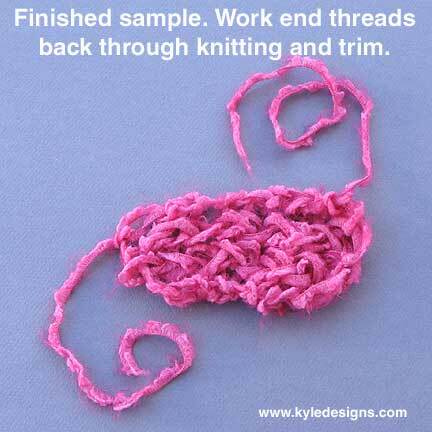 When finished knitting, cut or break yarn leaving about a 10″ long tail. 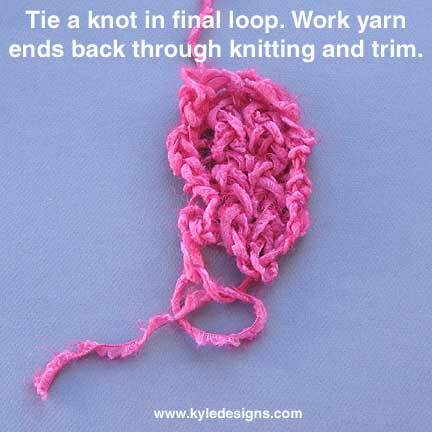 Take the end of the yarn and push it through the loop nearest the end, then loop lift loop off finger. Repeat for each of the other loops. Gently adjust tension and length, and avoid pulling too tightly unless you would like the knitting to come to a point (when planning to add puff ball). Tie a final knot at the last loop. On starting end, tie off beginning length of yarn that had been held in place on thumb. At each end, take the long end of yarn and work it back up through the knitting to hide, trimming off if necessary. Tie off each end of the project with a simple knot. Take long end of yarn & work it back up through the knitting to hide. Trim. If desired, you can add a puffed finished end. Cut 10 or 12 lengths of yarn (or more, depending on bulk) about 6″ long. Tightly tie together in the center, and then tie onto end of scarf. Spotted on Kyle by Design. Click here for link. 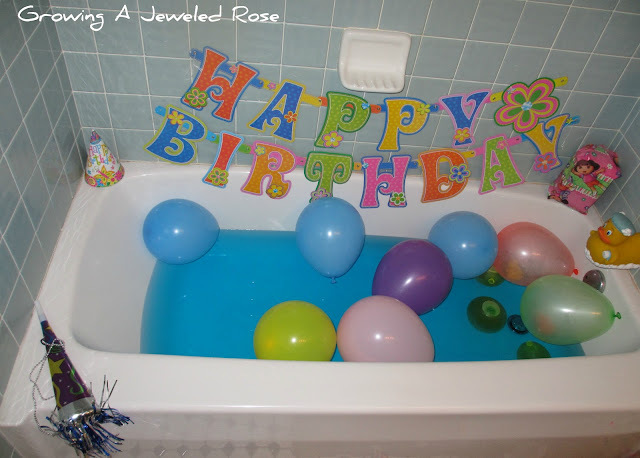 On your child’s birthday, turn bath time into a celebration. This is such a fun way to make little ones feel special on their special day! 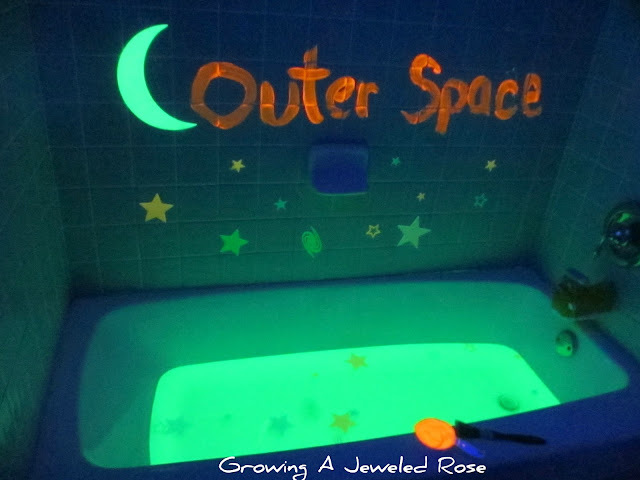 This bath is truly out of this world (couldn’t resist) What little one wouldn’t love this? 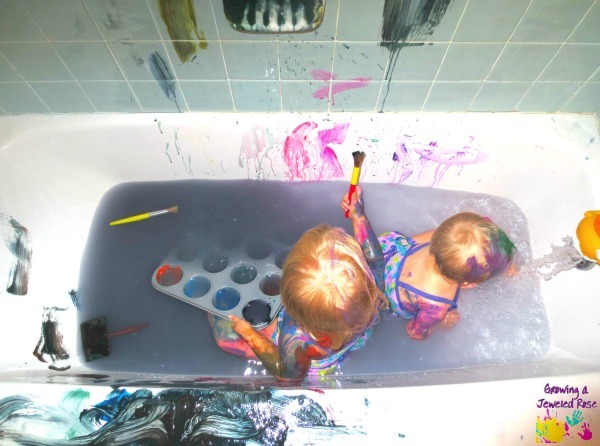 This bath paint is sure to add fun to any bath! My girls love this paint! 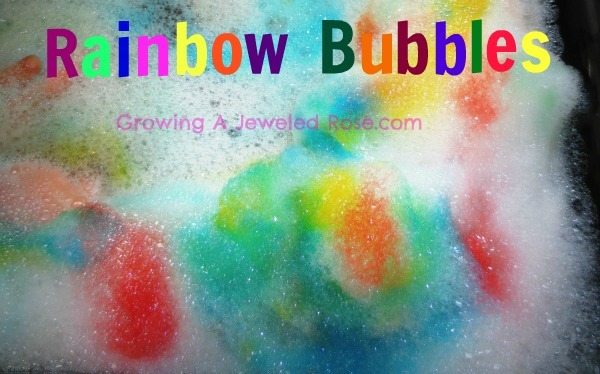 While we did this activity in the sink in the above post, these rainbow bubbles would be even more cool in the bath! 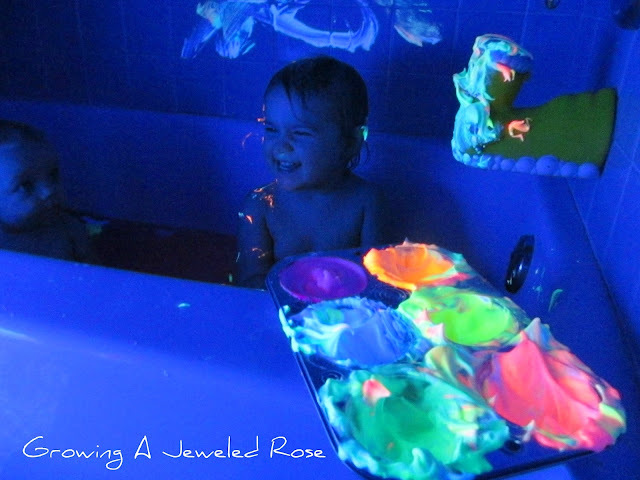 Let your little ones go nuts painting each other in the bath and then have a blast splashing around in rainbow water to get clean! 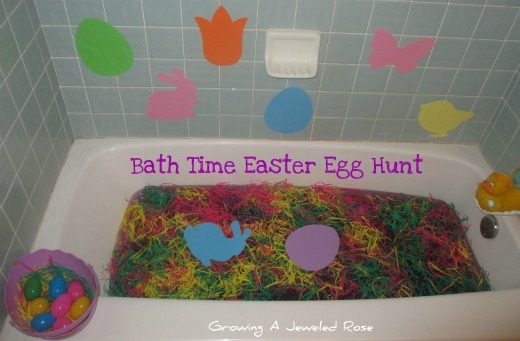 Such a fun and magical bath for kids! 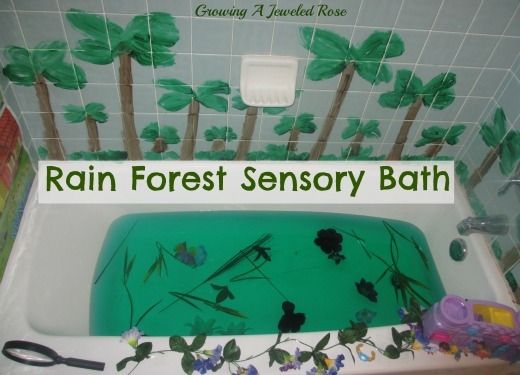 Escape to the jungle with this fun and imaginative bath! This bath comes together with pasta seaweed and the smell of the ocean! 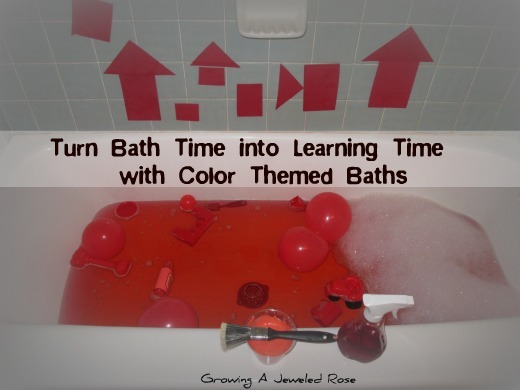 Color themed baths are such a fun way for little ones to learn colors! 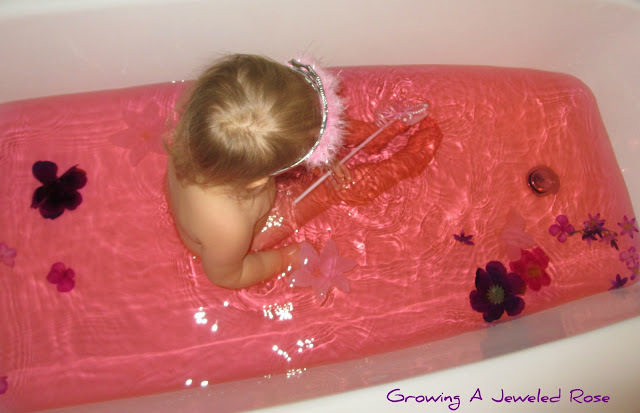 This is one of the girls favorite baths! Fun anytime! 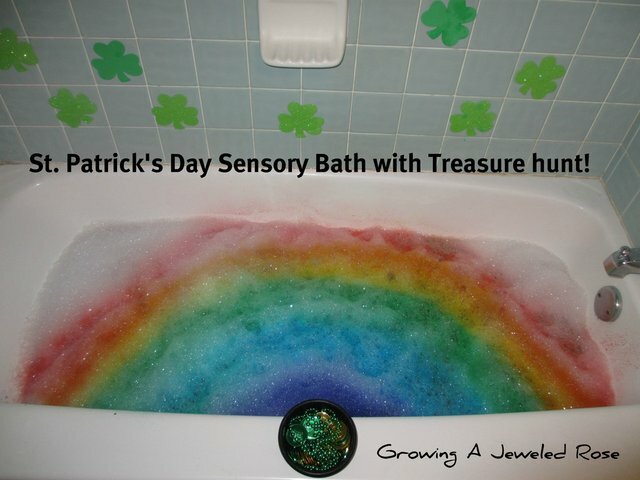 Not just for St. Patty’s. The girls loved hunting for eggs! 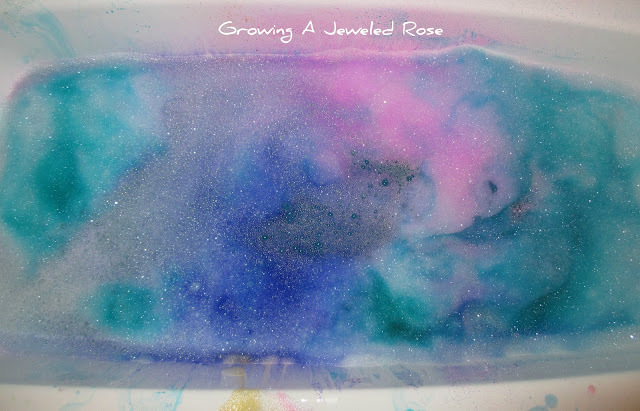 This bath is filled with little ways to show your love! 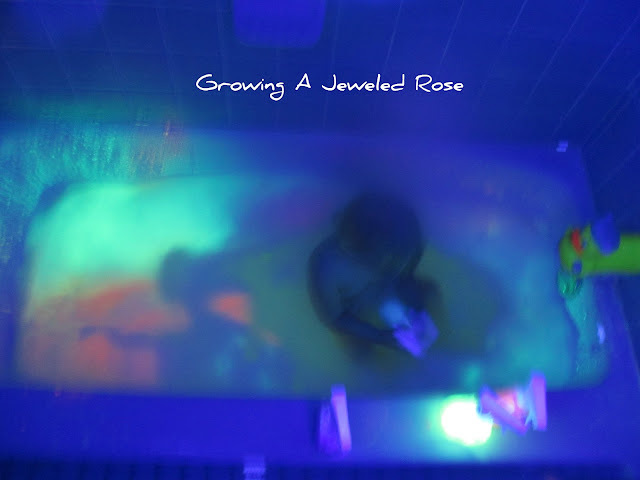 Spotted on Growing a Jeweled Rose. Click here for link.